Geo. 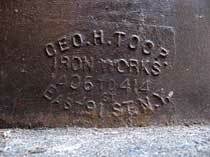 H. Toop / Iron Works / 406 to 414 / East 91st St. N. Y.
Foundry marks for Geo. H. Toop abound in New York's "Soho" cast-iron district. And in a rainbow of colors! A Toop building mentioned in Cast-Iron Architecture in New York, by Margot Gayle and Edmund V. Gillon, Jr., 1974, is 79 Grand St., constructed in 1872. Another is 127-131 Mercer St., 1881: "A six-story gray brick building of some pretensions has on its ground floor flat cast-iron pilasters." Blue in 2009, this cast-iron shop front was painted green in 1974. 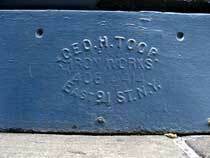 Two Geo H Toop founder's marks are found on shop fronts along the stretch of Columbus Ave. between 82nd & 83rd Sts. This one at 741 Columbus Ave. lies at the base of the Zingone Brothers grocery. A Toop shop front downtown on the East Side is this one at 404 E. 10th St. 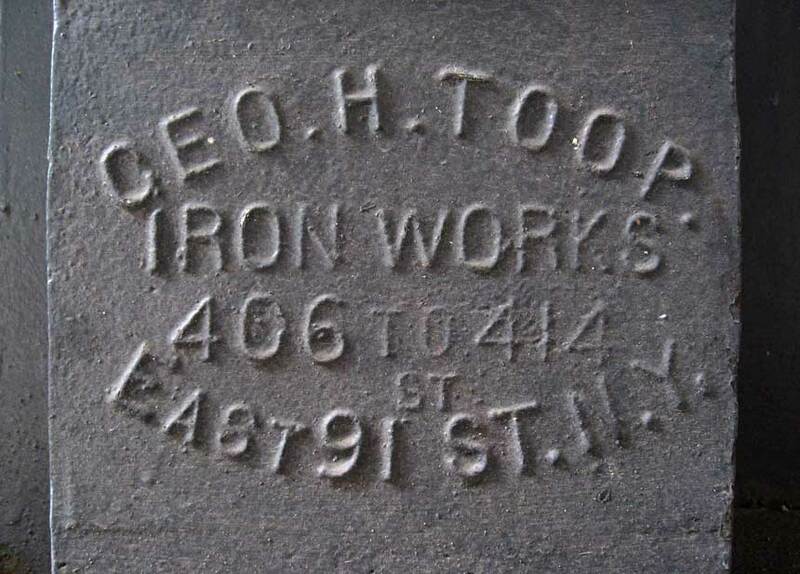 The first Toop in the iron business in New York was Charles Toop of Charles Toope & Co. whose listing in Trow's New York City Directory of 1872 reads, "Toope Charles, foundry, E. 88th n Lex. Av. h 154 E. 85th." (The Toop listings in Trow from 1872 to 1883 spell the name Toope, although the form without the 'e' is used in other sources during this same period.) George H. Toop (1836-190?) was probably Charles Toop's brother. Both men were born in England, and both are found in the U. S. Census of 1870. In the first enumeration of that year (June 1870) they were living together at dwelling 136, New York City, Ward 16, District 8. Charles was 36 years old and George 34. Charles's occupation was "Moulder, Iron" and George's was "Book Keeper." In the second enumeration (December 1870) they were living apart, Charles at 152 E. 85th St. and George at 276 W. 25th St. In the second enumeration Charles Toop's age was 40, and George was 30. Naturalization petitions for both (brothers?) 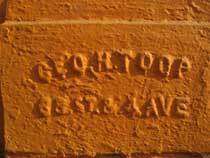 show Charles E. Toop naturalized 27 Sept. 1860, and George H. Toop 5 Oct. 1864. Both gave their home address as 41 Perry St. on these applications. George Toop joined Charles Toop in New York city directories in 1873. Trow's Copartnership Directory of 1876 indicates that this partnership had dissolved by that year, and Charles Toop disappeared from listings after 1882. The Geo. 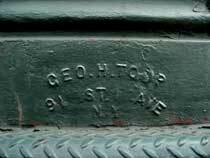 H. Toop foundry was located on East 88th St. near 4th Ave. from 1872 to 1887. They relocated to 406-414 E. 91st St. in 1887 and stayed there until 1906/07. George Toop probably died around this time. His son, William Henry Toop (1875-1958), seems to have taken over the foundry at this time. They also moved the foundry to the Bronx (2572 Park Ave.) in 1907. By 1918 the foundry had closed. William Toop registered for the World War I draft in 1918 when employed as a salesman for a vacuum cleaner manufacturer (the name is hard to read) located on Columbia St., Brooklyn. In 1918 William Toop lived in North Pelham, Westchester County, N. Y. This ad from 1897 located the Toop Iron Works on 91st St. near 1st Ave. The 1880 United States Census (non-population schedules) recorded Geo. H. Toop, Iron Foundry as owning $15,000 of real capital and $14,000 of raw materials. It employed as many as 16 men and 2 boys at annual total wages of $11,530. In the year from June 1879 through May 1880 it produced iron worth $30,000. In 1889 the New York Times, 8 Aug. 1889, p. 5 , reported that George H. Toop, along with H. J. Blaudet and George T. Crombie, had incorported the East River Mill & Lumber Co. Company offices were located at 425 E. 92nd St. from 1889 until the early 1930s. This ad for the East River Mill & Lumber Co. dates from 1916.